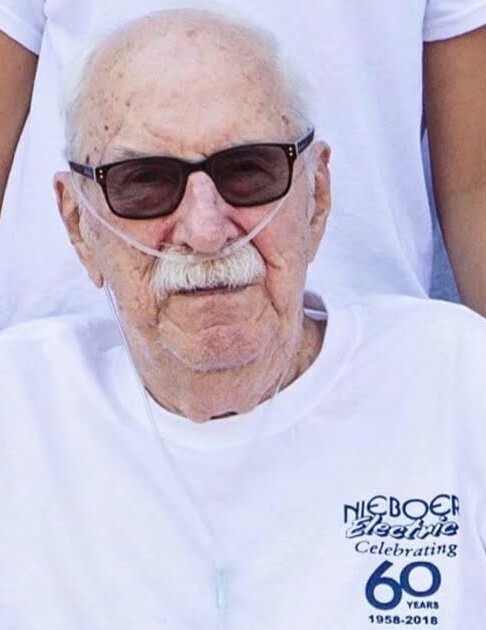 Obituary for Harry James Nieboer | Kroeze-Wolffis Funeral Home, Inc.
Mr. Harry James Nieboer, age 86 years of Fremont, passed away on Monday evening, August 27, 2018 at Spectrum Health Gerber Memorial in Fremont. He was born on November 18, 1931 in Fremont, Michigan to William & Elmira (Groteler) Nieboer. He was a US Navy Veteran of the Korean War, and he founded Nieboer Electric in 1958. Harry was a member of Second Christian Reformed Church in Fremont where he had served as a Deacon, Elder, Sunday School & Catechism teacher, Cadet leader, and speaker at the Newaygo Medical Care Facility Sunday Church Service. He also enjoyed going to the cabin in the Upper Peninsula, hunting & fishing, and traveling out West. On May 3, 1957 he married Elna B. Moon and she survives him along with 2 children: Douglas (Nanci) Nieboer, Laurel Bodrie; 4 grandchildren: Matthew (Katie) Nieboer, Meaghan Bodrie, Colton (Megan Schuiteman) Bodrie, Teighlor Bodrie; 2 great grandchildren, Hailey & Deacon Nieboer; 1 sister, Betty (Jonas) Chupp; and brother-in-law, Harold Visscher. Harry was preceded in death by 2 sisters, Virginia DeYoung & Evelyn Visscher. The Funeral Service will be held at 11:00 AM on Thursday, August 30, 2018 at Second Christian Reformed Church in Fremont with Pastor Doug MacLeod officiating. Visitation will also be at the church from 10-11 AM on Thursday. Interment will be at Maple Grove Cemetery in Fremont. Suggested Memorials: Second Christian Reformed Church, or the Fremont Christian School Endowment Fund at the Fremont Area Community Foundation. You can sign the online guest book at www.kroeze-wolffis.com. Arrangements are by Kroeze-Wolffis Funeral Home, Inc. of Fremont.